High-tech covers from WutGroup make space conversion easy – at the touch of a button. Swimming pools quickly convert to dance floors, banquet centers, or basketball courts in less than 5 minutes. WutGroup’s premier product, the WutPool cover, is a patented load-bearing retractable pool cover that provides added benefits for home and commercial property owners. WutGroup covers are available for commercial and residential applications of any size. The WutGroup product line is ever-expanding with new applications and technology. Learn more about the features, benefits, price and process on our How It Works page. While we initially began with pool covers, we quickly learned of many additional applications. Learn more on our Applications page. Single-use facilities and spaces become a thing of the past with the patented load-bearing covers from WutGroup. Specialty covers from WutGroup generate usable hard surfaces that can support most any activity. Each patented load-bearing retractable cover from WutGroup is custom designed and manufactured using extruded anodized aluminum or stainless steel that span the width of the area to be covered. WutGroup covers are lightweight yet strong enough to support the activities you desire. Design experts at WutGroup consider every customer’s needs and deliver the best solution to convert single-use spaces into multi-purpose areas that will be enjoyed for years to come. 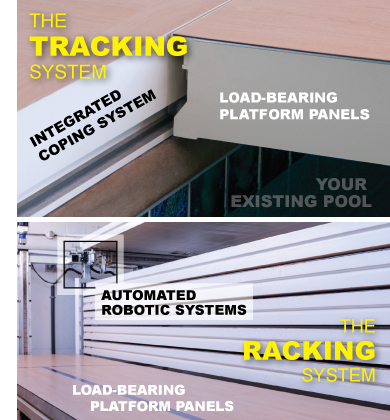 WutGroup delivers value with every technologically innovative load-bearing cover. Watching the video above to get an overview. Learn more about the features, benefits, price and process on our How It Works page.